Is there room for both Todd Frazier and Chase Headley on the 2018 roster? The 2017 Yankees season was a wild ride that by most accounts exceeded our expectations. 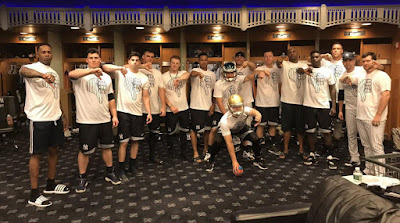 It delivered many exciting moments from players all throughout the roster and although the young players were the focus this year, there were veterans on the roster that played key roles and helped drive the Yankees’ postseason run. Even though the core stayed the same, Brian Cashman made a lot of deals this season to transform and improve the Yankees’ roster. One of the key pieces he acquired was third baseman Todd Frazier. The Yankees’ corner infield positions caused the team a lot of headaches throughout the first half of the season. Greg Bird tore up spring training and was looking like he would be a force at first base, but a bad luck foul ball at the end of the spring lingered into the season and would ultimately require surgery and put his season in doubt. That handed the everyday first base job to a combination of players headlined by offseason signing Chris Carter, which didn’t work out well for everyone involved. As the Yankees approached the trade deadline it was clear that they had a need for stability and production at both of their corner infield positions. Enter Todd Frazier, who was acquired along with David Robertson and Tommy Kahnle from the Chicago White Sox. 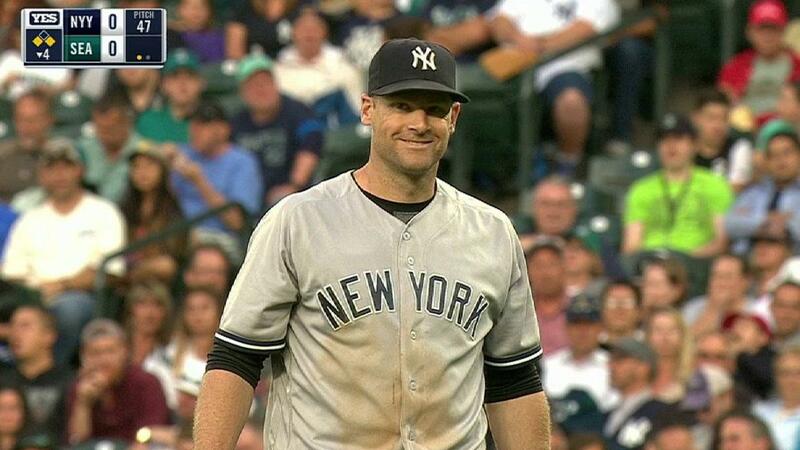 Although the Yankees had Chase Headley in house already, the instability and lack of production at first base created multiple needs and Headley’s previous experience playing first base opened the door for the team to acquire another “full time” third baseman. When Frazier was acquired he became the starting third baseman and pushed Headley into a rotating role at first base, third base, DH and coming off the bench. Until Greg Bird returned in late August Headley was essentially the starting first baseman and he more than held his own. He had been OK up to that point, but Headley had improved slightly on his production from the 2016 season and the Yankees were getting so little from first base that anything they got from Headley was an improvement. By some numbers, Headley improved at the plate after moving to first base even though it was a small sample size, putting up a .284 BA with 5 homers, 15 RBI and a .349 OBP in 39 games at first. In 85 games at third base Headley posted a .276 BA with 5 homers and 41 RBI and a .357 OBP. Overall Headley batted .273 with 12 homers, 61 RBI and a .352 OBP in what was probably his best season at the plate since he came to the Yankees. Headley also offered stability with the glove at first which was badly needed after what they got at the position previously. Headley appeared at first base in 45 games, starting 37 of them and in that time he made just one error. His play at first base was arguably better than what he did at third before Frazier arrived. In 86 games at third base last season, Headley committed 13 errors and often seemed to have trouble making strong, accurate throws across the diamond. Frazier was much more solid at third and probably took some pressure off of Chase during the second half of the season. 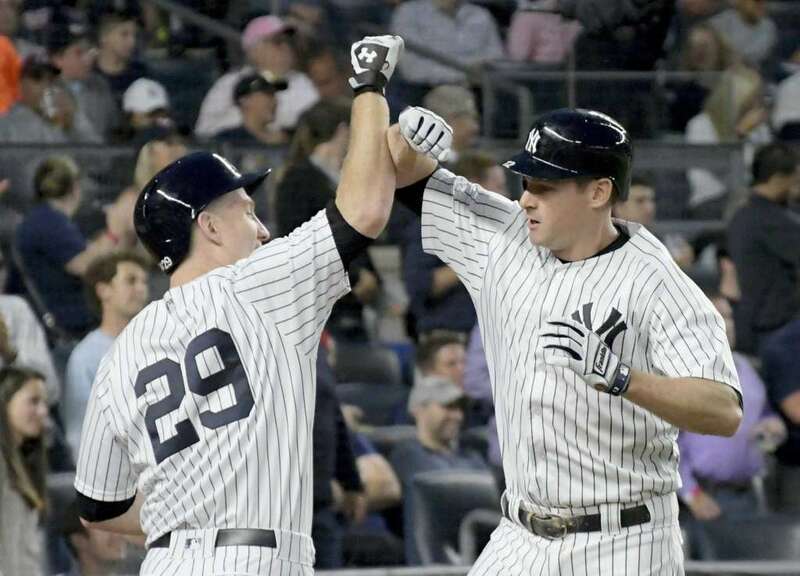 It also seemed like Headley was energized, both offensively and defensively, by the challenge of changing positions and that versatility he showed down the stretch could help his case to stick around as more young players arrive in the future. Now on to Frazier himself. He has never been a high batting average guy, but he has been a middle of the order hitter who will hit home runs and drive in runs. Despite a lower than usual batting average, he was doing exactly that up until the time of the trade. In 81 games with the White Sox in 2017, Frazier batted .207 with 16 homers, 44 RBI and a .328 OBP. In 66 games with the Yankees he batted .222 with 11 homers, 32 RBI and a .365 OBP. He was also an improvement over Chase Headley with the glove, committing just six errors in 66 games. Overall, he helped the Yankees solidify their infield with his defense while adding depth and power at the bottom of the lineup. Frazier was also a hit with the fans and clearly a great guy to have around the young guys in the clubhouse. Hailing from Toms River, New Jersey, Frazier was clearly energized by being on a contending team and playing close to home. His personality was often a lift to the team and the fans in the stands. He was the driving force behind the “thumbs down” movement which became the rallying cry of the team down the stretch and throughout the playoffs. Overall, Frazier provided more of the total package than Chase Headley did this season and it helped the team make a run. His energy and production on the field were important down the stretch and his personality and marketability off the field excited the fans and were probably well received in the front office as well. 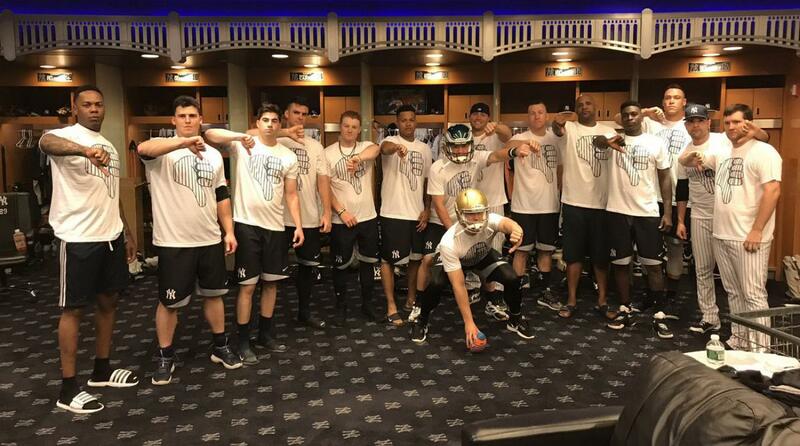 Frazier became a fan favorite despite only being on the team for two months, with “thumbs down” shirts popping up all over the stadium as the season wore on. Frazier even published a piece in The Players Tribune at the beginning of the playoffs. Now it may seem like I’m saying this to make Frazier seem great compared to Chase Headley but that’s not the case. These are the strengths and weaknesses that will be factored into who is ultimately brought back next season. 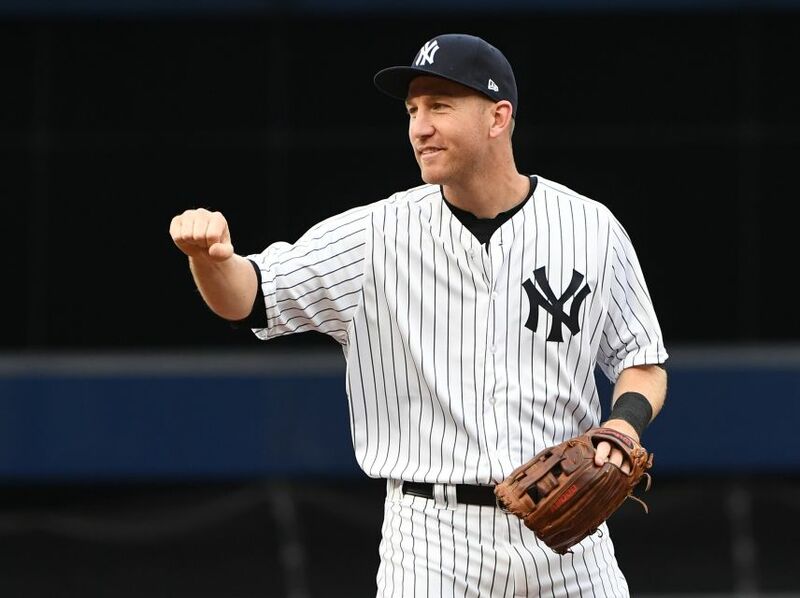 The question is, is there room for both Todd Frazier and Chase Headley on the 2018 roster? Now I believe that the Yankees would like to have Frazier back but there a few things that would make that complicated. The most obvious one is that Headley is under contract for next season and Frazier is not. Both of these players were able to exist on the same roster in 2017 but with multiple prospects knocking on the door, with Gleybar Torres and Miguel Andujar among the big names, it seems unlikely they would be able to in 2018. It is unclear when this next wave of prospects will begin to arrive but it will likely be early in 2018. The health of Greg Bird is another key factor going forward. With Headley performing well at first in his absence, if Bird were to go down again the team would surely love to have him to fall back on. Although Frazier has less experience away from third base, he is open to playing other positions like first base, left field and right field in the future if it would help his chances of returning the to team. “I could still play other positions, I know I can. I did it for the first three years with the Reds. I did rather well out there. I’m not afraid to change positions.” Both Frazier and Headley would be good mentors to the team’s young infielders as they arrive and both could eventually slide to the bench and soak up some DH at-bats since Matt Holliday will likely not be back. Finally, how the team plans to build its bench will be important in deciding this battle. Attempting to keep both would likely cost them a player like Ronald Torreyes, who doesn’t offer the power of a Frazier but offers more contact as well as far more speed and versatility. With Jacoby Ellsbury losing his starting spot down the stretch and moving to the bench that leaves even less wiggle room in how the team plans to construct that unit. Other articles will dig more into this but the Yankees’ system is so deep that Cashman would likely have the pieces to attempt to make a deal around Ellsbury or Headley if he wanted to. For now I think it is safe to say that, barring injury or other unforeseen circumstances, it would be very difficult for the team to keep both of these players. Although Headley is under contract and brings a lot of positives to the team, I believe Frazier proved he could be valuable enough on the field and off it to force the team to consider bringing him back. Brian Cashman will have a lot of work to do this offseason to clean up clogs at certain positions and how he does will affect what happens with Headley and Frazier. How Cashman plans to solve these problems remains to be seen and it is unlikely we will get answers soon. Cashman operates in the shadows and his moves usually come out of nowhere. As we have seen with Joe Girardi, Derek Jeter and others, Cashman is very serious and often ruthless in his pursuit of improving the team and that approach will surely continue. With this offseason being Frazier’s first time as a free agent, this problem could solve itself if he receives a big contract offer from another team. He has made it clear though that he is willing to do what it takes to stay with the Yankees if they are interested in bringing him back, “I would love to have this challenge and I would love to play for this city for the rest of my life, I think it would be awesome.” As the Yankees move further into an era of young players and prospects, the team has an important decision to make between two valuable veteran pieces here. Both players have a lot to offer the team and will be useful no matter where they wind up. It is possible that the team will look dramatically different next year and with the Yankees’ offseason just getting started, all we can do is sit back and watch Brian Cashman go to work.